FYI: I sent both the html and text version in the same emai. All the buzz going around about Killer Content is there for a reason and the program is definitely living up to all the hype. Killer Content is getting ready to go viral in a big way, believe me. To say this is a full featured program for creating an online presence that will dominate any niche you are is an understatement and does a disservice to the program. For the first time someone (Socrates Socratous the creator) has compiled an unimaginable amount of extremely high quality content and married it to a “thing” that is hard to describe. It is a data management program, but that sounds too complicated and if I call it a word processor that sounds too simple. Whatever title you want to give this program is up to you, but it is the most powerful tool to search and manipulate data a marketer will ever need while at the same time it is as simple as editing a document. Let me walk you this to give you an idea what I am talking about. You create a project; this is as simple as clicking on the word “new project” and typing in the name of your new project. Then you search the list of only God knows how many super high quality articles. You don’t just search this list randomly, although you can if you want. You search this list by Keyword. Yes, you type in the exact keyword or phrase you want and the filter will generate a data base of thousands of articles with your specific keyword. When you open an article you can edit and change the article any way you want, right there like you were on your favorite word processor. With a click of a button you can even “spin” the article right from the same screen with a very powerful spinning program. When you get the article the way you want it then you just save it to your project. Then you just repeat the process over and over until you have as much content as you want in the project you created. Now you go to your project to complete the process. You can auto-post your content directly to your blog. The auto-post program lets you control every aspect of how the content will hit your blog. You can set times and dates for each article to hit or you can just send them out all at once the choice is yours, but to just have a choice at all is something amazing. Just because you are posting your content doesn’t mean the fun will stop there, you can generate an ebook in pdf format directly from your project window with a single click of a button. Click, BOOM! An instant ebook with chapters arranged in the order of the article numbers in your project. Once again, you have full control over the look, feel and layout of the book and it is less complicated than a word processor. Like I said, I don’t know what kind of a title you would give a program like Killer Content, but if I ever meet Socrates I want to shake his hand. I highly recommend this system. This review of Killer Content is an unbiased opinion, but it may not sound that way. Socrates (the creator of the system) has turned fantasy into a reality. Every one of those “I wish this program would” obstacles you have faced in the past are definitely in the past now. If you are doing anything Internet related from marketing a product to marketing yourself, Killer Content is what you need. You simply click on the “Site Manager” icon on the Dashboard and add your blog information so the program knows where to send your “project”. Now that it knows where things are going, you simply create a project by selecting the articles related to your blog. They have thousands of articles to choose from and your can edit, modify or even spin the article right on the screen. When you are satisfied with the article you can save it by clicking the “project add” icon. Now you have a project with one article in it. Select more articles and save them to the same project until you build up a sizable amount of content and then you are ready to publish. One incredible feature of the article data base is you can search it by keyword. Yes you heard that right; you can search thousands of articles by the exact keywords you are using for your blog. That is a feature I will never be able to live without keyword search again. Now that you have a project you can do one of two things or both. You can publish it to your blog with the “Auto Poster” which has so many features it could easily be a product of its own, or you can generate an eBook with each of the articles appearing as a new chapter. Create an ebook in pdf format with a click of a button? This is also something that could be a stand alone product and something I can no longer live without. That is it. It took me longer to talk about Killer Content than it did to put about one full two years worth of content on my own blog. In this Killer Content Review I would like to focus on one specific and very powerful feature the product is equipped with, and that is the 980 niches it directly supports. Socrates Socratous has been an innovator in Internet marketing for years and if he has spent over 18 months developing a product, you know it is a complete solution. Selecting the right niche is the most important part of a marketing campaign and people either put too much thought into or not enough. Unfortunately the latter is more common. Killer Content is definitely the right name for this product because they have an insane amount of content right your fingertips (over 150,000 articles). With this much content, leave it to Socrates to take something as potentially frustrating finding content for your niche and making it a simple click of a mouse. This is proof that experience does count. All this content is categorized into 980 distinct niches with that number changing daily, not only being added too, but being modified as trends change. Killer Content is not a static product that will ever be finished. It is a living monster that is lurking behind the scenes and adapting to every change in the Internet environment. Having over 980 niches available at the click of a button was just not quite impressive enough for this Socrates Socratous character though. All of the content within each niche is even searchable by keyword. If your niche would benefit from content with, let’s say “party balloon”, one click later and you have thousands of articles in your specific niche with your specific keyword to choose from. Everyone always says to act now because space is limited, but with Killer Content space really is limited. The dynamics of Internet marketing have changed and Killer Content will become the industry standard without a doubt. I strongly suggest, no I urge you to look at this product now. If you miss out on this opportunity you will be paying a freelancer to use their Killer Content account to do the work for you, and that would be a shame. To have a marketing tool pre-quipped with 980 distinct niches is a dream for any marketer. In this Killer Content Review I am going to cover not only the 980 niches, but also how the mass of content on Killer Content can be filtered and searched. Socrates Socratous has been the “go too guy” in the Internet marketing industry for 8 years. All the big Gurus know him and have used his products and solutions and you probably have also. You just may not know his name. Socrates and Killer Content are two names you will not soon forget. The first step in a marketing campaign is to select your niche. The second is to get the content for this niche. In a pure stroke of genius (in my opinion) Socrates has created a product that categorizes over 150,000 articles into 980 niches, but it does much more than this. 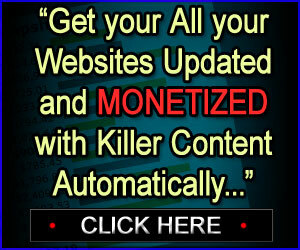 He has been working with a team of professional on this project for over 18 months so you know Killer Content not only deliver, it will become another Click Bank #1 Now that you have selected a niche, you can search this mass of articles by keyword. Select a few hundred articles with your exact keyword, edit them on-screen any way you desire and resave them. With a click of the mouse your articles will automatically be posted to your blog. One click to a niche, one click to content and one click to postings. What could be simpler? I strongly recommend Killer Content and I applaud the effort and vision of Socrates Socratous and his team on the creation of a game changing product like this. The time to act is now and this is not an understatement. Your competitors are probably using Killer Content right now, so do not get left behind. It is one thing to have a mass of content categorized into 980 niches, but how on earth can you handle all that data? In this Killer Content Review I want to cover the genius behind the vision of Socrates Socratous and his new product, Killer Content. In less than 3 minutes we will go from the Killer Content log in page to your blog having over 100,000 words of keyword rich content. First of all, if you are marketing online and not familiar with the name Socrates Socratous you should be ashamed of yourself. He is the “go to guy” in the Internet marketing industry and has been for 8 years. Hold on tight because this will be a fast ride. The Killer Content System is just that, a mass of outstanding content in the form of over 150,000 articles. That is not too impressive yet, most of the ezines have 10 times that many articles. What is impressive is what you can do with this staggering amount of content. We all know content is king so you better run out really quickly and buy yourself a crown. Killer Content has categorized this data into the top 980 niches, so your specific niche is covered for sure. Go to your niche category and then type in the exact keywords you want. This will generate thousands of articles in your niche, with your exact keywords. Are you starting to see the benefits? It gets better. Now that you have selected your content you can edit it right on the screen by hand or with one of the most powerful pieces of article spinning software I have ever seen. When you are done, save it. Do this as many times as you want to get more original content. When you have as much content as you want, click auto-post and Killer Content does the rest. Everything is on its way to your blog. Socrates Socratous and his team have done it again. Your competitors are probably using Killer Content right now. I Strongly recommend you try this product. You are going to love it – I promise. and DONT FORGET to add me to your contact lists to make sure you get my emails on time. We will also have commissionable upsells and cross sells from within the membership site. Those will be locked to the FIRST JV partner to refer the lead. We will hardcode your CB id inside each member's account. For example, someone who turns down the upsells, decides they want an upgrade a week later, we show them YOUR affiliate link to complete the purchase. You can contact me at: socratesJV AT gmail.com anytime with any questions and requests. Thanks in advance. I truly appreciate your support and looking forward to reciprocate. The new FTC Guidelines for affiliate marketing came into effect on December 1st 2009. As an affiliate or JV partner you've read and fully agree to the terms listed on the official FTC Website - http://www.ftc.gov/bcp/guides/guides.shtm to ensure that you're promotions are compliant with the new guidelines.